It's that time of year when you can't get enough of backyard bashes, firing up the grill and hanging with friends for an impromptu barbecue. Whether it's a small gathering or a holiday get together, nothing feels more like summer than enjoying a late day barbecue. While most everyone enjoys something straight off the grill, those with food allergies might have a differing opinion. But before the season passes you by why not learn some great do's and dont's so that those with food allergies can enjoy the great days of summer grilling as well. Whether you are the host or the guest take the time to plan ahead. Remember that by taking a few extra minutes to think about those with food allergies the barbecue can be a success for all invited. 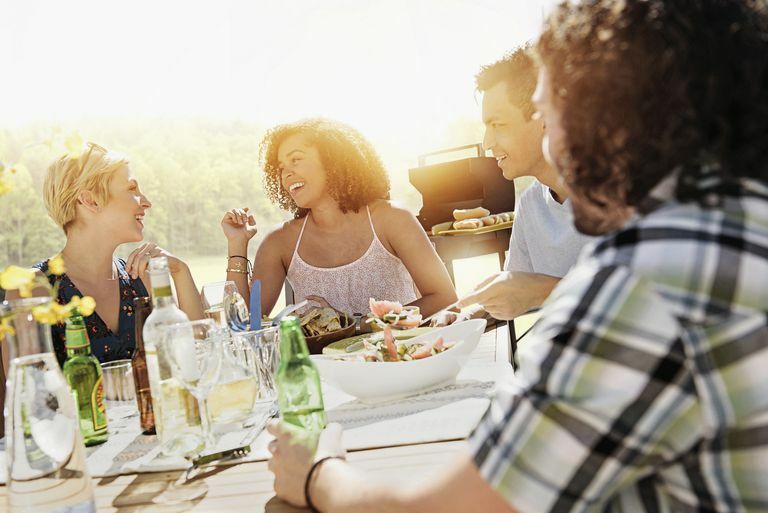 If you decide to host a barbecue, you may invite someone who has a food allergy. Before you set out to plan the day, try some of these tips to keep everyone safe and well fed. Plan the menu. Pre-plan a menu and be sure to include items that your guests with food allergies can eat. For example, if you are serving cheeseburgers and someone is dairy free, be sure to get dairy free cheese as well. Or perhaps you need gluten-free buns for someone with a wheat allergy. Perhaps rather than serving grilled shrimp, you can opt to serve chicken skewers to avoid potential dangers for someone with a shellfish allergy. Save the labels. Be sure to keep labels handy for your guest to review before eating anything.This way they can read for themselves to ensure that the food is allergen-free. This will not only be considerate, but will help to ease the mind of the person with food allergies so they will be more relaxed. Cross-contamination. In order to avoid cross-contamination be sure to keep markers handy. Let guests write their names on their plastic cups or plates to avoid mistakenly taking someone else's drinks or food. Or perhaps color code utensils and serving plates to differentiate among the regular and allergen-free foods. One big issue at a barbecue is often the cross-contamination from the grill for those with food allergies. Prior residue can remain on the grill from a previous day or the new marinades can drip and stick to the grill as well. To ensure food allergy safety, be sure to grill the allergen-free foods first before putting anything else on the grill. Before putting a bun on the grill it might be best to cook up the burgers first to help prevent contamination for those with a gluten allergy will be safe. Or perhaps the very last food to be cooked on the grill should be the Asian chicken marinated skewers, due to the issue with peanut allergies. Wrap it up. Keep aluminum foil handy. This can be used to prevent foods from having to be cooked directly on the grill where there is reason for concern about food allergies. Also, wrap up extras so that they can be saved for your guest for later, if they are still hungry. This way they won't accidentally be confused with another not-so-allergy-friendly food. Color-coded plastic containers can help to keep these items separate as well. Share. Talk with your guests before the barbecue to be sure you understand their allergy needs. Especially where there are kids, make sure you understand what they can and can not have to eat. This way there will be food for everyone to eat and no one will be left out. So you are excited you got invited to your neighbor's barbecue but then reality hits and you are thinking how can I possibly go? What can I eat? What about my food allergies? Take a few minutes to think ahead and with these ideas, you can go, eat, relax and put your food allergies aside. Talk to the host. Be sure you let the host know about your allergies ahead of time. Educate them on what you can and cannot have and ask what they will be serving. Offer to bring foods that are safe for you. For example, maybe bring a quinoa side dish for all to enjoy if you have a gluten allergy or offer to bring sorbet for dessert if you have a dairy allergy. This way you won't feel singled out and the host will be happy that you offered to help as well. Don't be shy. Ask to see a label if you are not sure if the food is safe. You know the old adage "better safe than sorry"? This one is certainly one to follow and your host will appreciate that as well. Your health and safety is most important and should not be taken lightly. Eat before you go. Sometimes it is wise to eat something small before you go so that you are not starving at the barbeque. This way you can enjoy the barbecue and eat what foods are within your comfort zone. It is always better than making the wrong choices just because you are hungry. Ask to be the first to eat. While at the barbecue be first in line to eat. Asking to have them cook up your food first will limit the risks of cross-contamination. When cooking on the grill the residue from marinades can easily contaminate the foods that are cooked later on. If your food was cooked first this will be a safer environment. Similarly, by choosing your foods from the side dishes first prevents the contamination from other guests hands or utensils. They also sell liners that can be used on the grill to help avoid cross-contamination. After the food is cooked the liners are disposable and can be thrown away. Medication. Bring your allergy medication and keep it handy in the case of an allergic reaction. Keep your epinephrine auto-injectable medication nearby in the event of an emergency, but be sure to keep it out of direct sunlight and heat. Bring snacks. Be sure to bring a variety of safe food snacks that are food allergen-free. This way while you are waiting for the food to be cooked you have something to munch on. And in the event there are not enough options, you won't be hungry and left out. After all, the food is not the only part of the barbecue experience. By having foods you are comfortable with you will be more likely to relax and be social. So as the summer barbecue season unfolds don't let your food allergies leave you behind. With some planning between the host and the guest, everyone can enjoy safely and happily! Cheers to a fun summer barbecue season.